Ok, so perhaps I was a little ambitious with the whole Saturday makeover idea. It ended up being both Saturday and Sunday and a pretty hard slog it was too! Mr and Mrs PTF are both thoroughly exhausted but satisfied with their efforts. Even Little O helped the team out by scraping the tan bark off the trailer all over the place into the garden beds, of course. She loves getting in there and getting nice and dirty. I wish I had taken a pic of her, she was just too cute! So...we eventually shovelled out all the wretched scoria and loaded it up into the trailer for the tip. Then we planted the hydrangeas and also some small agapanthas that we have had sitting in a big pot for about 4 years!!! Hey its a makeover on a budget, so whatever we could get our hands on was good enough! I have to admit though that I also went to Bunnings with Little O this morning (Sunday) and bought some seaside daisies (I could not resist...I love them). My excuse to Mr PTF was that its all about 'street appeal' however I think the winning point in the argument discussion, was the fact that I let him have a sleep in and I snuck out with Little O before he woke up!!! Hahahaa! So I will stop blabbing on. It is not the most exciting makeover to say the least...but here are the pics! 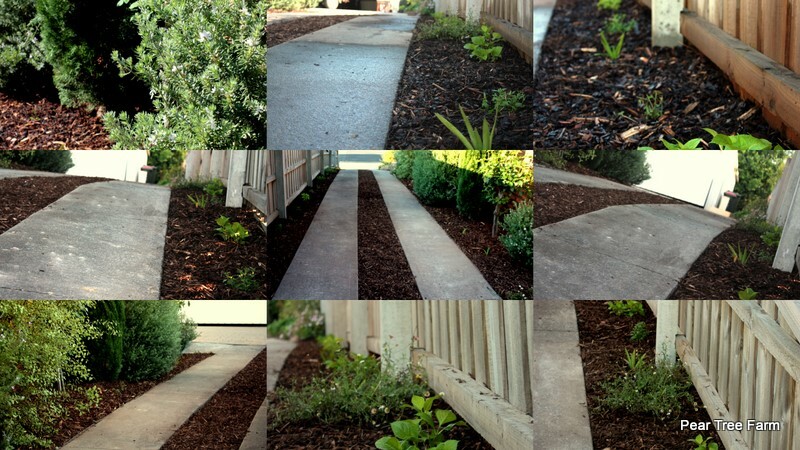 I decided to make them into a collage cos I mean how many photos of a driveway can you look at, one after another? We were completely wrecked after all this shovelling and digging. The soil was really dry, with lots of rocks,clay and dead tree roots, and it was really back-breaking work. So there you go a little prettying up of our driveway, all ready and waiting for sale! After all this hard work what more could you want then to sit down in the beautiful summery evening with a glass of Lemon Lime and Bitters with a slice of lemon and a sprig of homegrown mint and some mags....ahhh. Delish! We love what you've done to the driveway. What a great idea, and a wonderful improvement. Love your blog, and look forward to future installments. We now join you in a LLB. Thanks mum n dad aka PnK! You have been busy! Is't it great to sit down in the sunshine in late October with a cool drink. I'm loving all this warm sunshine - winter will be here soon enough! I L-O-V-E your beautiful blog! You are so amazing! Your drive way looks super to!! Missing you all lots of course!! Thanks for your message! I am glad you like the driveway, it made me smile when I had a look at it the next day with all the plants sitting there looking green and lovely. Missing you a gigantic amount and looking forward to seeing you all again one day...sigh.